Paneer, the cottage cheese so popular in India, lends itself to making some attractive and tasty starters. 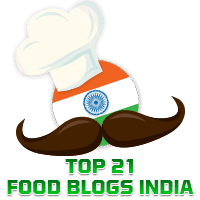 For example, elsewhere in this blog you will find recipes for Garlicky Chilli Paneer and Chatkedar Paneer. Today's dish is for a healthy starter for which the recipe is adapted from Hara Tava Paneer by Masterchef Tarlaji Dalal. Here the paneer pieces are marinated in a Hara Chutney and sandwiched with a filling made of sweet corn and onions and then tawa fried. The lemon juice and the sugar added while making the green Hara Chutney enable it to retain the colour. The ingredients listed will yield about 20 pieces. We loved this starter and I am sure you will too! For the Hara Chutney: makes 7 tbsp. approx. Dahi, (Low Fat Curds), 2 tbsp. Switch off the gas and allow it to cool. This form forms the filling for the paneer.